Well, I made it. Sixty. Not surprisingly, my Facebook page filled pretty quickly with birthday wishes from around the world. Most were short, but some reflected people’s memories and wishes. 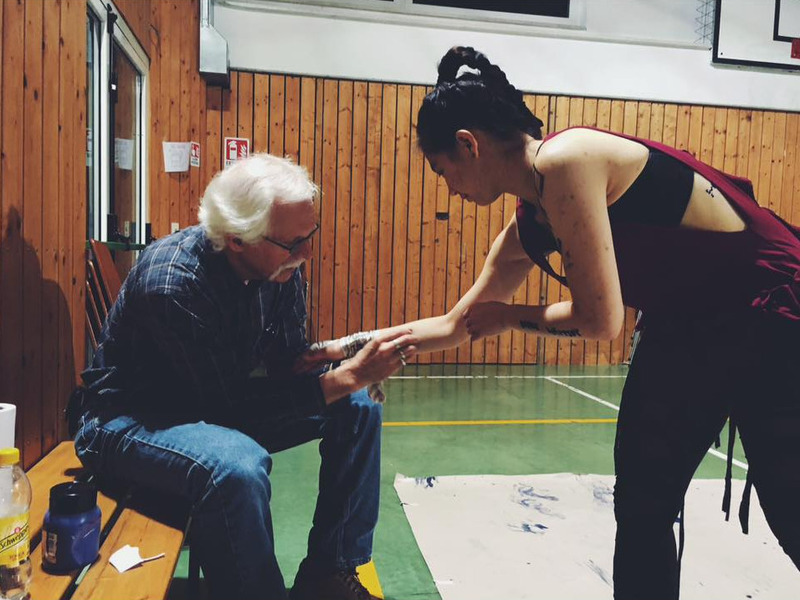 What particularly moved me about this image, aside from the fact that it brought back a smile–remembering a wonderful, energetic young dancer, full of passion for her art–was the way it so succinctly illustrated my role at the OM Arts Incarnate School in Italy this past spring. I was helping Sara cut a very tight bandage off of her wrist. As often happens with dancers, she had strained/injured her wrist over the last couple of weeks, and the bandage had been put on to protect it. At this point, however, her wrist was swelling from the pressure, and it had become quite painful. We were in the middle of practicing Sara’s final project, which she would perform in a couple of weeks at the school’s final exhibition. I was there because she had asked me to collaborate with her, doing a live drawing as a part of the performance. Sara couldn’t get at the bandage one-handed, so she stopped and asked me to help her cut it off. It was a delicate operation, since anything strong or sharp enough to cut through the tightly wound medical tape was dangerously close to the soft skin of her arm. We did eventually get it cut off without injury, and Sara was able to continue working. I found it interesting that she would choose this particular image, of all the photos she had of us in Italy, to send me on my birthday. This dance piece was the culmination of her creative work at Incarnate — the “Dance Warrior” — which, in many ways, brought together all of the truths she had learned, and the way her life and art were being transformed by her time at the school and God touching her through the Incarnate community. The moment captured here, however, was in sharp contrast to the power, energy and emotion of her dance. Instead, it was a hushed slice of time — a tender, uncomplicated moment of care between friends, beyond the edge of the spotlight, to help, support, encourage and comfort Sara as she struggled to create this powerful expression of her art. Perhaps, this image was Sara’s way of saying that, this defining moment was what she wanted to remember. Posted in Artistic Process, Blog, Identity, OM Arts and tagged community, Incarnate2016, story.